The 2016 colors of the year were recently named by Pantone and for the first time ever there are two! -- Rose Quarts and Serenity. Rose quartz in particular is one of my favorite colors and I am so excited to wear even more this year than I already do :) This pretty little cardigan is the perfect way to incorporate just a little bit of pink into this otherwise monochromatic look. 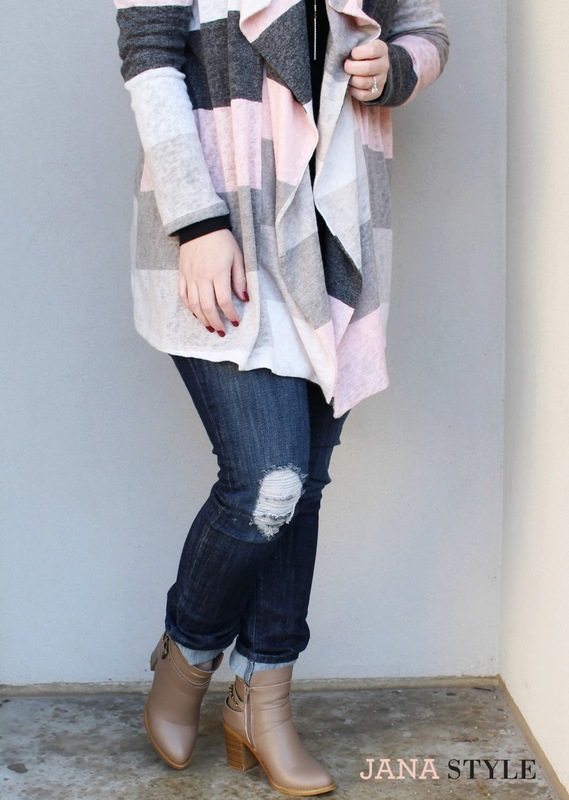 I love a comfy and cozy cardigan that goes with just about everything and this one is perfect for me! **Jana Style Tip -- If you are thinking about incorporating the new colors of the year into your 2016 wardrobe, start by adding little subtle pops of the colors into your outfits. Accessories, scarves, and handbags are great ways to play with color and start to gradually incorporate them. This post sponsored by Pink Blush. All opinions are my own. Happy December! Where has this year gone!? !